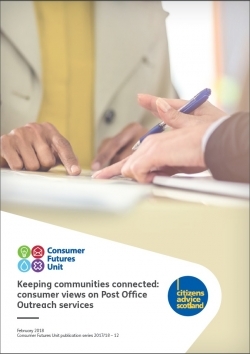 The Consumer Futures Unit at Citizens Advice Scotland carried out innovative deliberative research into what aspects of the Post Office Ltd Outreach network were most important to consumers in remote and rural areas, and why. The research, carried out by Ipsos Mori and Involve, was prompted by an internal CFU review of previous work on Outreach services. This internal review identified inconsistencies in previous methodologies used to evaluate Post Office Outreach services, making it difficult to compare the results of research over time. Our latest research, summarised in this report, is the first step to developing a robust evaluation framework. The research’s participants, all consumers who lived in remote and rural areas, valued good customer service from staff, reliability of services, and practicalities such as opening times and privacy. We also found that both awareness and use of Post Office Outreach services were low among research participants, despite all participants being recruited from areas with at least one Post Office Outreach service nearby. Communication was also a common theme during the research. Participants spoke about promoting the opening times and product ranges of Outreach services generally, but also how effective communication should be a vital part of contingency arrangements if something goes wrong and the regular provision of an Outreach service is affected. Participants referred to the importance of good communication, and were vocal about the frustration that can be caused by poor communication. The CFU intends to use these findings to draft an evaluation framework for Post Office Outreach services, following the recommendation from previous consumer advocacy work to establish regular and consistent monitoring of Outreach services. This will help POL (Post Office Ltd) and the consumer advocacy bodies across the UK to evaluate how Outreach services are performing and where a service may need to be modified or provided with extra support in order to continue meeting the needs of its community. As well as the main summary report, which you can access by clicking the "Download Publication" button below, you can also explore the technical report, which goes into the research methodology used in more detail.